Work for America’s Oldest College Newspaper! We accept applications for our editorial and business staffs fall, winter and spring terms. 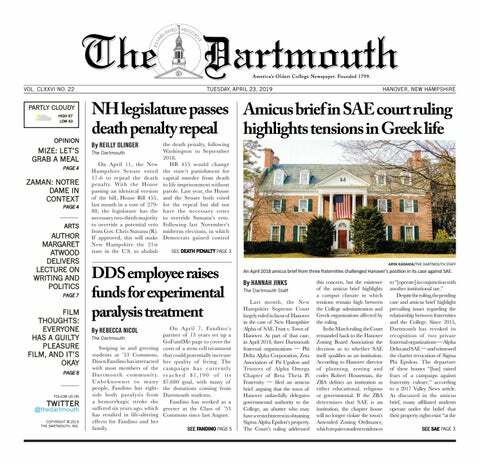 Located on the second floor of Robinson Hall (known as Robo), The Dartmouth’s offices constantly buzz with reporters typing stories, business staff selling advertisements, photographers editing shots and editors providing guidance and banter. As America’s oldest college newspaper (founded in 1799), we have undergone several changes over the past two centuries, and we continue to iterate upon and improve our practices every day. The D now prints daily, produces videos, runs a daily blog, and posts regularly to social media accounts (lately, we’ve been especially into Snapchat and Instagram @TheDartmouth). Our website drew over 183,000 unique visitors this past spring in addition to nearly 1,000 daily print editions. With over a hundred students on staff, The Dartmouth is one of the largest organizations on campus. We pride ourselves on our learning environment — many members of our editorial board had their first experience in journalism at The D, going on to develop real-world skills in communication, management and editing. Whatever your area of interest, The Dartmouth has a place for you. The news section keeps up with the pulse of our community, informing campus and our broader audience with happenings from all corners of the College. When news happens at Dartmouth, the community looks to The D for the important details. In recent months, we’ve covered topics such as presidential candidate visits, the College’s new house system and campus activism. More investigative pieces, on topics from administrative growth to gender breakdowns of Student Assembly candidates, allow us to dig deeper into campus issues and incorporate innovative techniques such as data visualization in the process. Covering both club and varsity sports, the sports section keeps the Dartmouth community up to date with Big Green athletics. In the past year, we’ve ramped up our sports analysis, showcasing hard-hitting investigations into coach departures as well as a number of regular columns by dedicated student journalists who also happen to be sports aficionados. Sports is found on the back of the paper every Thursday in addition to an eight-page Sports Weekly published every Monday. The D’s arts and entertainment section highlights creative endeavors at the College, covering everything from performances and exhibitions at the Hopkins Center for the Arts to new movie reviews. Arts also features profiles on the College’s own artistic talent, such as student playwrights, musicians and painters. The Mirror, our weekly magazine published every Wednesday, takes a critical and campus culture through both long-form features and more lighthearted pieces. In addition to photo essays, regular senior columns and “Through the Looking Glass” reflection pieces, some of the Mirror’s recent work include examinations of taboos, dating culture and religion at Dartmouth. Our Multimedia team is responsible for publishing The Dartmouth’s Snapchat each week. The team is comprised of designers, artists, writers, animator and more creative students who help to create a dynamic multimedia representation of the paper’s content and mission. Photographers at The Dartmouth give our readers a visual perspective on campus news, capturing events and scenes across campus and featuring them in print as well as online through our website and social media. Our design staff works to create visually appealing illustrations and infographics for all our sections, with highlights including Mirror cover art as well as graphics for the Editorial Board's weekly Verbum. The nature of The D’s daily print schedule lends special importance to our copyediting and layout teams. Members of our layout staff learn and use InDesign software (no prior experience necessary) to arrange stories and photos in a coherent and readable order. Launched five years ago, Dartbeat is the paper’s irreverent, wildly outspoken younger sibling and online blog, now our fastest-growing section complete with its own website. In addition to commentary on campus quirks (see “The Definitive Ranking of 1902 Room Portraits” and “Types of People You See at Green Key Concerts”), dining hall innovations and the popular Overheards and Trending@Dartmouth weekly lists, Dartbeat has expanded into lifestyle quizzes, giving students a chance to ponder philosophical questions with a Dartmouth-specific twist (“Which Collis Stir Fry Sauce Are You?”). People are often surprised when they learn that The Dartmouth is a completely student-run organization and that we receive no funding from the College. In fact, The Dartmouth is the largest student-run business in Hanover, offering students an unparalleled level of real-world experience. The business side of our staff works to ensure that the paper’s editorial content can reach its intended audience and remain an independent, unbiased source of information. Students with a wide range of interests can find a place in one of the various sections comprising the business staff. The advertising and finance section sells the ads that fill the paper’s pages and appear on the website. Students build long-term client relationships to create mutually beneficial advertising packages and plans. The team works closely together to develop forward-looking strategies and promotions. Our growing technology staff support the paper’s online presence. Tech staff at The D creates web pages for special issues and troubleshoots issues with our website. Current projects in development include a mobile app to centralize our content and highlight exceptional work. The strategy staff works in teams to solve the paper’s most pressing problems. Where should we be distributing the paper each day? How should we redesign the website? How do we effectively recruit and retain talented staff given that all positions at The D are unpaid? The strategy team is a great place to work closely with peers to unpack the big-picture questions involved in managing and developing a business. The product development staff works on alternate revenue streams — from smaller-scale ventures like student classifieds and apparel to more long-term projects. This team offers a mix of strategy, creativity and implementation that directly lends itself to the skills needed in careers like management consulting. The communications and marketing staff focuses on staff and alumni relations as well as social media. The social media team develops and implements social media strategy on all platforms, while the communications team works on alumni outreach, staff recruitment and internal development. This staff also plans our termly social, called D-Tails, and our annual Banquet and Changeover events. Both the business and editorial staff offer a wide-range of learning opportunities to build valuable skills and to work alongside diligent and creative peers. Mentorship is an invaluable component of working at The D, and you can often find upperclassmen giving advice to underclassmen on classes, job interviews, campus social life and everything in between. With a great network on campus and beyond, the D is a great place to gain practical skills while building lasting relationships. Our alumni have gone on to win Pulitzer Prizes, write for publications such as The New York Times and The Wall Street Journal and hold positions at elite finance and consulting firms. Come say hello to our staff at the activities fair or during our open house during the first week of classes each term, and be on the lookout for a blitz about hiring and applications. If you have questions about the Editorial staff, feel free to email our editor-in-chief at editor@thedartmouth.com. If you have questions about the Business staff, please reach out to our publisher at publisher@thedartmouth.com.